Why weren't there missions from the URSS to the outer solar system? Was there ever a program or study for a mission of sorts farther then Mars? Is there anything that survived about that? EDIT: Ah see you added this already in your edit. as far as I know, the only mission that was developed beyond the basic idea was the YuS Jupiter flyby and small perihelion solar probe. I was able to find a detailed description of it, which I used for my book "Robotic Exploration of the Solar System - part 2". IIRC the same source was used for an article in Quest a few years ago. i'll try to recover it then! where can i find the books? -Zevs (Zeus) (1970) : a mission to Jupiter that would use the planet's gravitational field to leave the ecliptic plane (like ESA's Ulysses probe did in the 1990s). It turns out Zevs was part of a TsNIIMash study on future interplanetary missions under a research program called "Galaktika" (Galaxy) approved by a government decree on 21 July 1967. It looks like the main goal of Galaktika was to see what kind of technology would be needed for the in-depth exploration of the planets both in the inner and outer solar system. On 31 December 1969 TsNIIMash produced a report on its findings. It apparently concluded that the Proton rocket could still be used for missions to the inner planets, but only if it would be fitted with a fluorine/ammonia upper stage or a nuclear-powered upper stage called 11B91. The fluorine/ammonia upper stage came very close to flying, but was cancelled in 1977. Plans to fly the 11B91 (on a version of Proton that was apparently known as 11K88) never moved beyond the drawing board. - Zevs : described in Molodtsov's post as a mission to study an outer planet, with the possibility of studying the planet from orbit and dropping probes into its atmosphere (so not necessarily a Ulysses type mission). A mission like that to Jupiter using a 3.2 ton probe was considered possible no earlier than 1974. - Titan : a Soviet equivalent of Voyager's Grand Tour to the outer planets. The report focused mainly on the technological challenges that such a mission would pose to the Soviet space industry. The large mass and limited lifetime of Soviet satellites/probes were noted as major stumbling blocks. Also as part of Galaktika studies were made of a 70-m diameter dish antenna (P2500) to maintain communications with probes in the outer solar system. TsNIIMash was only one of several institutes that performed studies in support of Galaktika. NPO Lavochkin was also involved, but could not spend much time on it due to its preoccupation with ongoing lunar and planetary missions. Outer planetary probes weren't attempted because they were simply beyond the reach of Soviet technological capabilities. They never demonstrated any success with Mars missions, trying to send a probe to Jupiter, Saturn, etc was asking far too much. Soviet engineering wasn't able to overcome the problems of reliable communication from those distances (one reason being that all communications infrastructure for space missions was in the USSR itself and they lacked NASA's global tracking network which greatly limited their tracking capabilities) or handling the cold temperatures of the outer solar system. The lack of an LH2-powered rocket stage also severely limited their ability to launch a probe to the outer Solar System. this is what we wrote about YuS in "Robotic Exploration of the Solar System - part 2"
In the 1980s the Soviets also started their first serious studies of missions to the giant planets and to the vicinity of the Sun. The idea was that the missions should provide a leap in knowledge not only with respect to NASA’s Pioneer and Voyager reconnaissance, but also the follow-up work of the Galileo and out-of-ecliptic missions. Soviet scientists and engineers identified three baseline mission profiles to address these requirements. In the first profile, a spacecraft would fly within 100 km of Jupiter’s volcanic moon Io and then use a slingshot of the planet to increase the inclination of its heliocentric orbit and send it back to pass within 3 or 4 million km of the Sun after a flight lasting just over 3 years. However, it would be difficult to make observations of Io because the relative velocity of the encounter would be greater than 40 km/s, and at such close range this would produce an angular rate exceeding the very demanding one degree per second which the Vegas had faced in attempting to track the nucleus of Halley at their closest approach. An alternative was to limit the mission to the Jovian system and land a capsule on Io. Another possibility was to use Jupiter to reach Saturn, where the spacecraft would enter orbit around the planet and deliver a Titan probe. If this could be done ahead of the joint US–European Cassini mission, then all the better. However, the most thoroughly studied option was the YuS (Yupiter–Solntsye; Jupiter–Sun) mission. It received the support of the Academy of Sciences; and many institutions, including some of the leading technical and scientific universities, agreed to participate. The YuS spacecraft would weigh 1,200 kg at launch and would incorporate the UMVL propulsion unit, a trajectory control module and a mission module. In fact, the trajectory control module was essentially the spacecraft’s bus. It was to be built around a 320-cm-diameter parabolic antenna designed to communicate at distances in excess of 6 billion km from Earth. As the principal structural element, it would support tanks and (depending on the mission) up to six RTGs. Beneath the antenna was a conical equipment section, with attachments for the mission module. In the case of YuS, this would be a 460-kg spin-stabilized Solnechnii Zond (solar probe) shaped like a ‘flying saucer’ and powered by a chemical battery. At its center was a thermally insulated spherical module housing most of the systems and electronics. Communications would be through a parabolic antenna mounted flush against the anti-Sun side of the saucer. An alternative design was for a conical mission module with 60 kg of scientific instruments. The trajectory module would carry most of the instruments for the Jupiter flyby, and would be discarded about 10 days prior to the solar encounter, the active part of which would last only 16 hours and involve both directly sampling the corona and making high-resolution observations in the X-ray, ultraviolet and visible ranges. For non-solar missions, the trajectory module would carry landers, atmospheric probes etc. The YuS project was named Tsiolkovskii after the early-20th-century Russian astronautics pioneer. On the schedule announced in 1987, the first mission, named Corona, was to be launched in 1995. At an international meeting about the solar–terrestrial relationship, it was suggested that Corona and Starprobe should be flown at the same time in order to make complementary studies. In 1999 missions would be launched that would release probes into Jupiter’s atmosphere and use that planet to reach Saturn carrying a Titan probe. The entry capsule for Jupiter would weigh 500 kg, and be able to endure a 1,500-g deceleration. The Lavochkin bureau built a special centrifuge to test it. 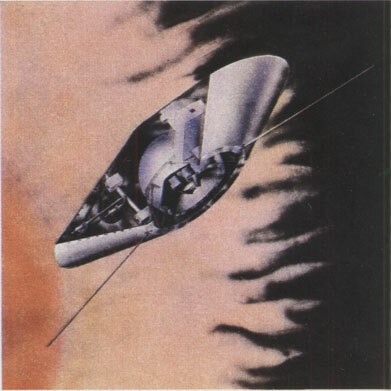 One concept for the Titan probe was to use a balloon as the decelerator, and that after this had released the surface package it would rise to an altitude of about 10 km and report conditions for several days. Unfortunately, owing to the financial crisis that followed the collapse of the Soviet Union the Tsiolkovskii project never left the drawing board, but Russian engineers and scientists continued to study advanced missions, in particular close-perihelion solar probes. Their space technology was pretty good. With Buran, the USSR took heaps of mineral ores to make a huge unmanned spaceplane (the Energia rocket engines were very advanced, although Buran used the aero shape of the Shuttle). -- In 1965 when most missile & space design teams were grouped into the new "Ministry of Medium Machinebuilding", the missile guidance and telemetry groups were exempted and stayed under the Minister of Radio-Electronics. -- Vacuum-qualified electronics and thermal control systems were never developed. Every unmanned spacecraft had a pressure hull filled with dry nitrogen at ~16psi with cooling fans blowing it around. Manned spacecraft had two pressure cabins, one for the crew and one for the electronics. Even today this system is used in Soyuz/Progress. It places a huge weight burden on the designers. -- Even in the dry nitrogen environment, component failures were frequent and spacecraft lifetimes short. Just look at the vast number of communication and ferret satellites launched compared with the US. Read the Springer book "Soviet Robots in the Solar System" for detailed accounts of the many failures on Moon, Venus, and Mars probes. Another factor was the lack of RTG power units. The Sovs made a lot of these for terrestrial applications but never used them is space. Possibly they were too heavy. So Soviet missions to Jupiter and Saturn could never go beyond the Vu-Graph stage. The lack of proper transistor electronics was a well-known handicap of Soviet spacecraft. The US space program had totally phased out vacuum tubes by the time Gemini was flying, even Mercury used partially transistor-based electronics. They had to use a separate module for an airlock to perform spacewalks on Voskhod 2 and Soyuz 4-5 because they couldn't depressurize the main crew cabin as was done on Gemini/Apollo spacewalks. No fuel cells either while they were used in US manned spacecraft from Gemini 5 onward. They still to the present day have to rely on heavy, clunky solar panels to power Soyuz. -- Even in the dry nitrogen environment, component failures were frequent and spacecraft lifetimes short. Every Soviet space station from Salyut 1 to Mir had at least one significant component malfunction during its operating life that impaired its ability to perform missions properly, and two stations outright failed shortly after launch and never got to actually see any use. Soyuz spacecraft had quite a few failures over the years as well, especially the several missions aborted due to inability to dock with a space station. Just look at the vast number of communication and ferret satellites launched compared with the US. Read the Springer book "Soviet Robots in the Solar System" for detailed accounts of the many failures on Moon, Venus, and Mars probes. They flew a ridiculous number of military satellites although this was partially because the things were very low-tech compared to US satellites and cheap to build, so they could be churned out in huge numbers. The Venera landings were a nice engineering feat as far as getting back a few pictures before the environment destroyed the landers, but they weren't terribly useful from a scientific standpoint. That NASA never tried Venus landers was probably because it was deemed not worth it to just get back some pictures for about an hour and radar mapping of the planet was the approach taken instead (the Soviets really had no other option but to land since their technology wasn't up to radar mapping Venus). Trying to launch any planetary probes was difficult in the early years but NASA had mostly gotten things figured out by the time Mariner 4 flew. The Soviet planetary program didn't achieve any measure of reliability until the '70s and Mars still proved an insurmountable obstacle. No they weren't, the Pioneer Venus probes did that a good 7 years earlier. Low resolution radar altimetry, though, not SAR as Venera did. by Paolo Ulivi et al. The description of YuS is on pages 130-132.
seconded. Later the Soviets managed to fly a pair of probes to Venus, dropped balloons into the atmosphere, and then flew to comet Halley, when NASA completely missed the comet for all kind of reasons, including Bruce Murray over-inflated ego with the solar sail, followed by the fiascos of the SEP and cooperation with ESA.